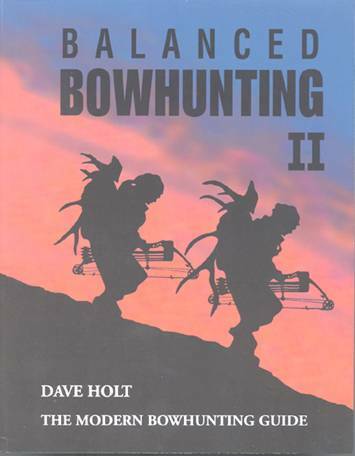 A completely revised, expanded and widely-hailed version of author Dave Holt's best-selling earlier book “Balanced Bowhunting” , which has been out of print for some time, has put his great book back in print. Dave Holt is recognized for taking a common sense “what works” approach to the subject of bowhunting at a time when technology is rapidly changing this method of hunting. “Balanced Bowhunting II” is subtitled “The Modern Bowhunting Guide” with chapters on such subjects as Shooting and Tuning, Buck Fever, Range Estimation and Trajectory, Shot Placement, The Compound Bow at Work, The Bow and String, Arrows, Broadheads, and accessories – plus a detailed appendix. Many photos, 7x9 format, 204 pages. With a Foreword by Dwight Schuh, Editor of Bowhunter Magazine.